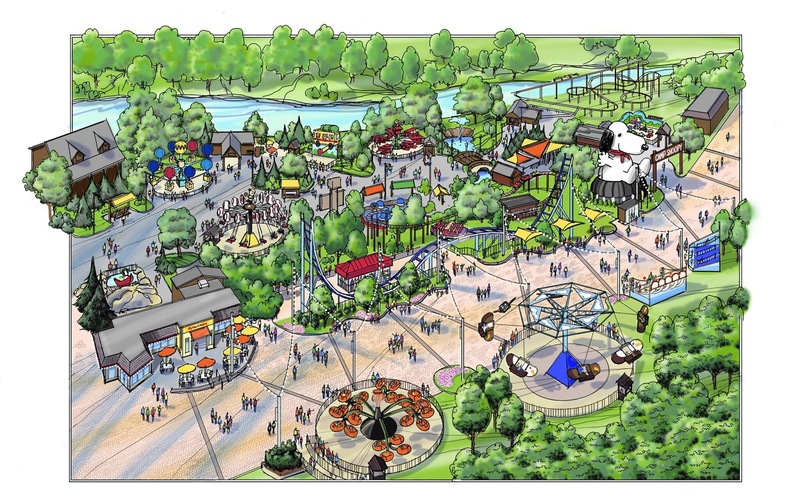 InSanity lurks Inside: Cedar Point's 'Big Announcement' a Dud? Cedar Point's 'Big Announcement' a Dud? Well this morning was the 'Big Announcement' for 2014 involving Cedar Point amusement park in Sandusky, Ohio. I hesitate to call it a 'Dud' of an announcement but I think all of us were expecting a lot more then what we got. For 2014 Cedar Point is adding "Family Style" Flat Rides to improve the Gemini Junior midway area. In the image we find a new "Flyer" is being added to the park called 'Lake Erie Eagles'. This is kind of a surprise addition, 'Flyer' style rides are often removed from parks these days, not added. The next addition is another flat ride called 'Pipe Scream' which is an adult version of the popular kids 'spinning tugboat' attraction. The other move will be Frog Hopper which is being relocated from the midway to Planet Snoopy and renamed to "Woodstock's AirMail". Up next on the 'Big Announcement' from Cedar Point is the much needed upgrade of Hotel Breakers, which has been falling in quality for years now. Over the winter the hotel will receive what is the equivalent of outside face-lift, cleaning up it's dingy appearance. In the winter of 2015 the hotel will begin renovations and upgrades inside. Personally, it seems like Cedar Point got this backwards. Upgrading the inside should be your first and most imporant move to get people back into your high-priced doors, outside can easily be completed in the summer months while open. Again, just my opinion there. Honestly, I don't consider this it be 'big news' at all. Badly needed resort upgrades and fixing an already cluttered midway, don't really fall under 'big news'. Oh, good news for sure.. just not the big news they hyped it up to be. What about that 'Dark Ride' rumor?! No word on the mystery 'Innovative Dark Ride' we all suspected would be involved in this announcement. Perhaps this really was just a rumor born out of hope or maybe it's a 2015 addition? Right now, we have zero answers and the park isn't like to talk. Today we found out news that Canada's Wonderland, NOT Cedar Point will be getting a dark ride. Canada's Wonderland is the most 'seasonally attended' park in the Cedar Fair family. Could they be testing this up at Canada's Wonderland, only to add it to Cedar Point later? We don't know but check out the dark ride Canada's Wonderland is getting!